Feel free. This is a shortsleeve dress with contrast embroidery detailing and a scalloped hemline. It's made with a lightweight modal fabric. I love it but I’m taking it back because I’m pregnant. Thought it might work for a pregnant body but it doesn’t. It’s too bad because if I wasn’t pregnant I would LOVE it. Love love love this dress. 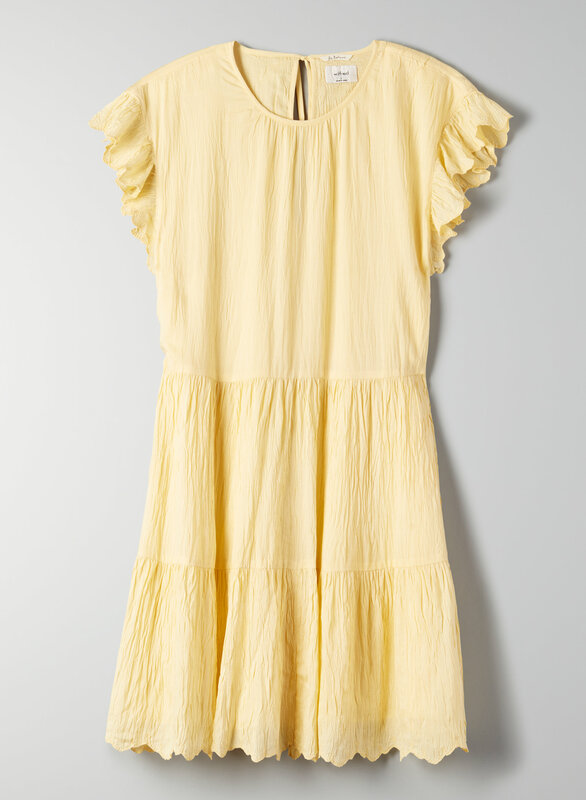 I purchased it in white and it is so cute for a country concert/ causal summer dress. I would recommend this dress as I like the style and fabric! However, I was disappointed in the yellow colour, although called "Lemon Meringue', it's pictured as more of a neutral, creamy yellow but was more of a brighter, vivid yellow in person. It wasn't quite what I was expecting.